USG employees Jim Sheehan, left, and Melvin Hottois with the new signs. ALABASTER Twp. 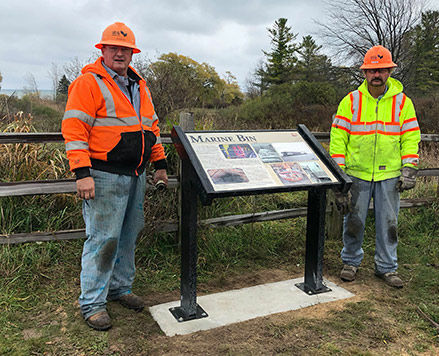 – The Alabaster Bike Path Arboretum, part of Michigan’s Iron Belle Trail, has three new interpretive signs along the pathway for people to read about the history of the U.S. Gypsum Marine Bin. The signs were donated and installed by U.S. Gypsum. They are located at either end of the bridge over Pilot Creek with a view of the still-standing Marine Bin. These signs also show how ships were loaded. The tramway of the US Gypsum Company at Alabaster has long been a tourist attraction. Built in 1928, the tramway stretched 1.3 miles out into Saginaw Bay. Cables used to carry the rock with a cable system that carried 72 “buckets” of gypsum to a waiting freighter at the Marine Bin. The tramway was dismantled in 2002. Removal of the Marine Bin building on Lake Huron is currently waiting for regulatory approval. Demolition will commence as soon as possible after approval, but will be limited to completion during only the summer months. This project is on the site plan for 2019.